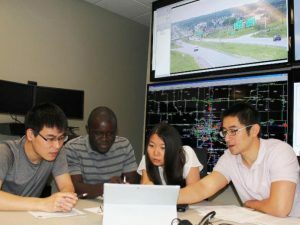 Graduate students studying in the Traffic Operations Laboratory at the Institute for Transportation. Iowa drivers may take the state’s safe, high-quality roads for granted, but not researchers at Iowa State University’s Center for Transportation Research and Education (CTRE). The Alliance for Iowa State highlights the CTRE program.